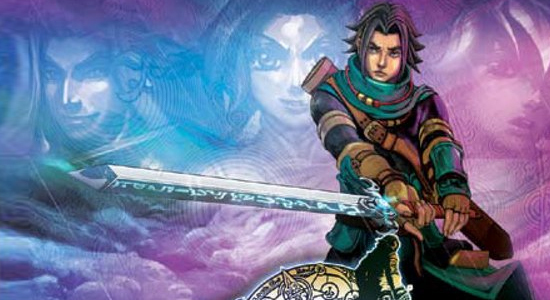 lack Sigil: Blade of the Exiled for the Nintendo DS has a few good qualities, but has quite a few poor design elements that make it an otherwise forgettable title. The game follows Kairu, a young man who was born with the misfortune of being brought into a world of magic and lacking that unique gift. Mistrusted and despised by others despite his noble heritage, Kairu is sealed away by his father to keep the peace in the land. Deep in the cave lies a means to travel to another world. Kairu has no choice but to venture forth to worlds unknown. While fairly standard fare for an RPG storyline, Black Sigil's plot does have some high points — however, they are completely overshadowed by poor pacing. Case in point: the game's opening took me roughly three hours to get through. Hardly the way to get players interested in a game when they're stuck in a small area to explore in the first place. One random encounter too many.Visuals for the game are pretty poor for a DS title. Character portraits are blocky and just plain look weird. Icons and other menu graphics are hard to see and make out clearly, making menu navigation more tedious than it has to be. Special effects are likewise underwhelming and disappointing. If there is one ray of light here, it's that the score for the game is top-notch; quite catchy and overall very well done. The core for any RPG after its story being its combat, Black Sigil uses a action-based combat style for its battles. You're able to move your characters around the battlefield, which is fortunate, as many of your attacks are area-based. However, the actual area of these attacks is limited and more often than not you'll find that many of your attacks will miss their intended targets. Another problem with combat is that you can't move through your own characters. There were many instances where I had characters completely unable to engage in combat just because they couldn't get past their own teammates. The only real value to combat in Black Sigil is that you do have to think out your battle strategy to come extent. Even regular fights can become a challenge if you go in unprepared; this should be considered a bonus for those who like to plan out an attack strategy. One other way in which Black Sigil succeeds is level design. There are plenty of nooks and crannies to explore with plenty of secrets to be found, encouraging exploration of the game's dungeons. But this is completely overridden by a major design issue: the sheer amount of random battles you'll encounter. Many classic RPGs have random battles, and they're loved or hated to some extent, but Black Sigil takes things to an unhealthy extreme. Running into five battles just by going around a small corner in a dungeon is a bit excessive by most people's standards. This is mitigated a bit on the world map, where you can lower the encounter rate by holding down the B-button, but that doesn't work in the dungeons, so players had better be prepared for a long haul. There are also some concerns about the stability of the final version of the game. The game has frozen on me in several different locations, and I almost always had one character who would start battle with a different status aliment affecting them. These kinds of errors are incredibly annoying, making me question if this game was really ready for release. I was quite disappointed with Black Sigil. The game had promise but poorly thought-out design choices and sloppy implementation made it a bit of a wreck. It's only something that a die-hard RPG fan would be able to slog through.